Senior Capitol Correspondent Gossip Columnist Tim Skubick! Tim Skubick: Off the Record > MichiganLiberal. ...In Bizzarro World! 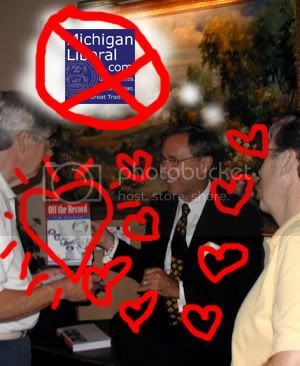 Tim Skubick hearts Michigan Liberal! He loves it so much that he decided to lambast the burgeoning political site and creator Matt Furgeson through the subscription-only MIRS News. The favorite blog for liberals to use for ranting and raving may be headed for the dumper sooner rather than later. The web site originator of Michigan Liberal.com [sic] is looking for new work and may be headed for a post in the Gov. Jennifer GRANHOLM administration. Last check revealed that no offer had been made, but either way it appears she will have to find another favorite site real soon as Ferguson wants a new and more financially rewarding gig. Oh, Timmeh. From faux-reporter to gossip columnist. I'm sure he reads PerezHilton.com, regularly, hoping that one day he can catch the Governor in a Britney-like moment. I guess exploiting the Ricky Holland murder to sink S.S. Granholm wasn't enough. Michigan Liberal isn't going anywhere, and Matt is not leaving the site. Rest assured, MichLib is still here to offer a nexus on all things political, and all things Michigan. If you want, hop over to MichLib to show it some pocketbook-style love. Next time, Tim, remember: Matt isn't the one railing against you on MichLib. That train is being led by Quaker21.